Nine Lives Antiques is a family affair. And trust me — it takes all four of us to get it done! My name is Tammy — and I’m the talker! When you come into the booth you’ll find me teaching people about the antiques we carry. I love to tell people where stuff comes from, how it was made, how it can be identified and what makes it special. Lois and Walt are my parents. Dad spent many years being a ringman for a couple of auctioneers. So from May to October it’s not unusual for my folks to be at 2-3 auctions a week. Obviously — they do a lot of the buying. But I have to tell you that my mom makes everything sparkle and my dad knows how to work that cash table. And Michael is my husband. He’d tell you he’s just my pack mule. But the true story is that he’s also our IT guy, a researcher and a pretty-darn-good picker. All four of us call Iowa home. Walt and Lois, however, are snowbirds who are fortunate enough to spend their winters in Florida. 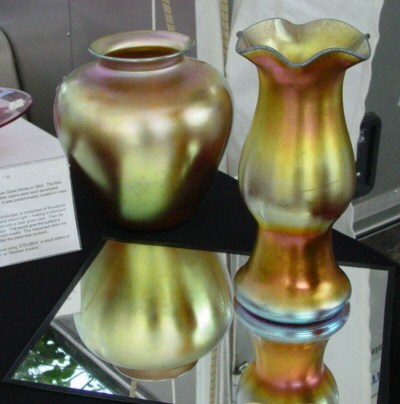 We specialize in fine antique glass and porcelain. And since none of us understands the meaning of the word restraint — we do it in a BIG way. At an average show we have eighteen 8-foot tables (with shelves) completely full of Art Glass, RS Prussia, Nippon, Moriage, Hand-Painted Porcelain, Mid-Century Glass, and Vaseline. Yes — Michael and I had a cat. A VERY persnickety cat. And we loved her. Now we have TWO cats. We also love them very much. But no, that is not why we chose the name Nine Lives Antiques. Our name really comes from the understanding that even though one family no longer wants to keep something — every antique deserves another life — and another family. Our job is to find someone else who will truly love the piece as much as the original owner did. Why Do We Do Shows? With the kind of inventory we carry it would be a LOT easier to sell over the internet — but we like to interact with our customers. We enjoy getting to know them. We look forward to seeing everyone and hearing about their year and what’s been happening in their lives. And we take great pride in helping them learn more about their passion and finding a piece that surprises and delights them! We learn! It is amazing how much we learn from our customers and other vendors. You would think with all of the information available all anyone would have to do is buy a book. But that’s not how it works. Books can get you started — but the best place to learn is to talk with avid collectors. They can help you understand the touch and the feel. They know the history. They can explain how it was made and what makes it special. And they can show you how to spot fakes and reproductions. Both of our families have shelves full of books — which we study. But we ALWAYS learn something new at every show! We’re nuts! Sometimes we look around and think we must really be dumb. Every other vendor gets set up in a couple of hours. It takes us a minimum of 5 hours just to get our merchandise on the table. We have around 2,800 – breakable – items that we handle at every show. We put Tiffany, Steuban, Moser, Mt Washington, RS Prussia and Nippon items on the table at outdoor shows where we’ve experienced wind, rain, sleet and yes, even snow. And it takes 4 of us over six hours to tear down after the show is over. We could sell Mexican iron. We could sell primitives. We could even sell furniture. But no — we chose glassware. Yep — we’re nuts. All glass venders are nuts. But its an addiction. How are you Tammy? How did surgery go? Loving the Hot Chocolate…Cocoa Set…It has six beautiful cups and saucers! Is this set available, (the one on the post card that I received today), or is that something from your past sales? LOVE, Love, love the set. As always, everything on our postcard is new since our last show Labor Day weekend. So yes, the RS Prussia Chocolate Set is available and will be at our show this weekend in Spirit Lake. And, actually, we did have you in mind when we purchased it. Can we plan on seeing you this weekend?